It is not just animals that are nocturnal, some flowers also come into their own as dusk gathers. 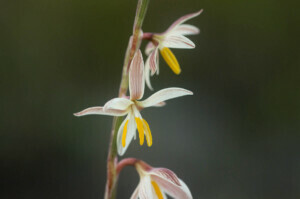 Hesperantha radiata is one of these flowers. During daylight hours, the dark red outer petals are closed firmly around the anthers and style. The flowers are almost invisible to a passerby and provide no interest for insects. However, during the last hours of the day, the petals sweep back and radiate outwards, projecting down and out the stamens. At the same time, a beautiful scent is released to attract passing moths and let them know that the plant is open for business. The generic name, Hesperantha, is especially apposite for this species. “Hesperos” is Greek for evening and “anthos” for flower. So species of the genus are commonly known as Evening Flowers. These nocturnal species are all white or cream coloured with dark reverse to the outer petals as well as fragrant. They attract small moths for pollination. However, night-flowering is not universal within the genus and the non-white species with yellow, pink, red or purple flowers, are generally diurnal and unscented. Species of Hesperantha, including Hesperantha radiata, were originally included within the genus Ixia. Despite initial similarity, the two genera are not particularly closely related within South African Iridaceae. Hesperantha has greenish opaque bracts beneath the flowers, where as those of Ixia are membranous and translucent, often brownish. 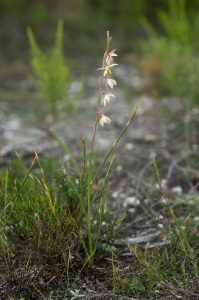 The closest genus to Hesperantha is Geissorhiza but Hesperantha has a style that divides just below the mouth of the tube into three long branches. In Geissorhiza, the style is well-exserted from the tube and divides into three short branches only at the tip. Hesperantha radiata is a very widespread species, unusual for extending far beyond the winter-rainfall zone. The species is found from Namaqualand, through the Western and Eastern Cape, KwaZulu-Natal and into Mpumalanga and Swaziland. Careful study of the species has been unable to separate out the different populations on a geographical basis. 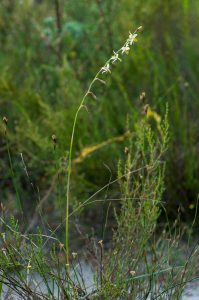 However, one subspecies has been defined that has more crowded spikes of smaller flowers, subsp. caricina. The most significant difference between the subspecies is the flowering time. The typical subsp. radiata flowers from July to early September, while the smaller-flowered subsp. caricina flowers around October. 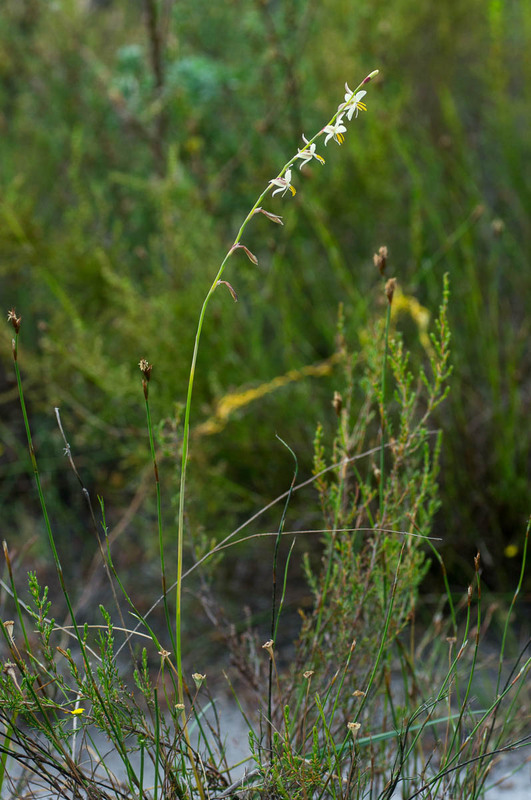 Both subspecies can be found growing in the same area and this is the case at Phillipskop. Because of the different flowering times, it is almost impossible for the two subspecies to cross-pollinate. Therefore they maintain themselves as distinct entities even when growing in close proximity. It also makes life easier for identification. There is no need to measure carefully the size of the leaevs or flowers. 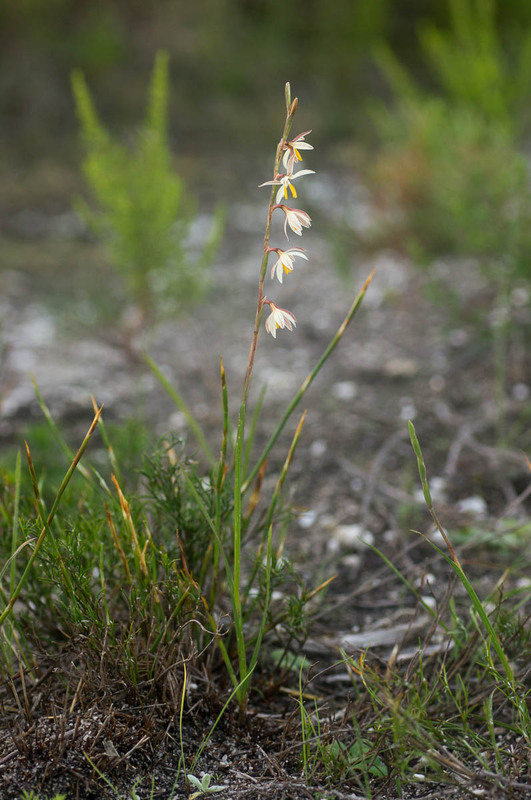 If you are visiting Phillipskop in July or August and see Hesperantha radiata, it is subsp. radiata. If you are visiting in October it is subsp. caricina. August, corm, Geissorhiza, geophyte, Hesperantha, Iridaceae, Ixia, July, night-scented, nocturnal, October, Spring, winter. Bookmark.